We hereby decree, “Let there be NO slop!” With the combination of the Dubro/Lunsford setup, your SCTE’s steering system slop and 100% of binding upon compression of the suspension will vanish when compared to stock steering linkages! Go on try them out. We dare ya! RC Racer Enthusiast looking for an edge on the competition. 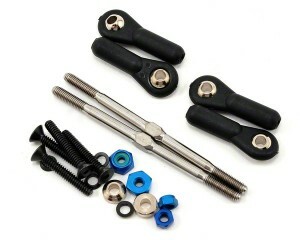 The MIP Pro4mance™ Front Steering Linkage Turnbuckle/Hardware Kit is for the RC racer who needs the competitive advantage of precision turning and handling with no slop. Fits all TLR SCTE vehicles with no modification! 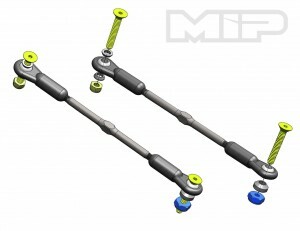 Direct replacement of stock linkages! Lightens your SCTE weight, while not compromising strength. Genuine Lunsford Titanium Turnbuckle and Dubro Rod-Ends! MIP Confetti Stickers (2), HW-Rod-End 4-40 Dubro (4), HW-Turnbuckle Lunsford 2.375 Titanium (2), HW- Washer 4-40 x .125 Angled (2), HW-Washer 4-40 x .050 Angled (4), HW-Nut 4-40 Mini Locknut (2), HW-Nut Alum 4-40 Locknut Blue (2), HW-FHCS 4-40 x 3/4 (4).